I’ve mentioned before that the problem in the North American capital-C Church is not that some churches are seeker-sensitive, but rather that some churches are seeker-hostile. Still, as we switch to a greater postmodern context, is it possible that some of our best efforts to be welcoming are no longer necessary? 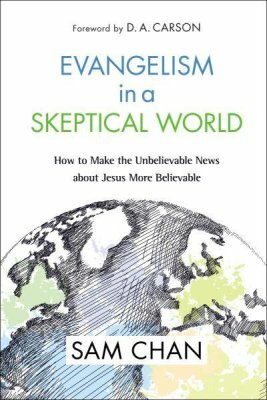 I’m currently reading Evangelism in a Skeptical World by Sam Chan. This book is literally overflowing with practical application for both churches and individuals. I thought I’d share this very short excerpt with you today (emphasis added). At our church, we designate February as Friends Month. This is the month we design the church service to be especially accessible to our non-Christian friends. But what does a service like this look like? When we used to evangelize moderns, the strategy was to simplify the service and remove awkward moments from the service — the offering, the prayers and the announcements. The idea was to get to the Bible talk as soon as possible. The idea was also that the Bible talk would be what moves our non-Christian friends to a point of conversion. They would hear the truth of the gospel clearly presented, and they would understand that they had a simple choice: accept or reject the truth claims of the gospel. But with postmoderns, we look at the whole service — not just the Bible talk — as evangelistic, because the whole service shows how Christianity works. When they see us take up an offering, they will see that we are generous with our money because Jesus himself generously gave himself up for us. They will see that we are content with our money because we trust God to provide. And they will see that the gospel has freed us from the hold that money has on us because God is our security. When they hear us pray, they will hear what a personal relationship with God sounds like. They will see that we have a God who is powerful enough to answer prayers but also personal enough to care about our little needs. They will hear that we love each other so much that we pray for each other in our churches. They will hear our cries for justice for the poor, oppressed and marginalized. And when they hear our announcements, they will hear that we take food to the sick, new mothers, orphans and people who have moved into our suburbs. They will hear that both young and old meet together in small groups. All the parts of the service show that we have a community of believers who are transformed by Christ and who restore our world by bringing Jesus’ love, mercy and justice. Married Couples Holding Hands in Church: No Big Deal, Right? Different denominations have different ideas as to the appropriateness of what are sometimes called PDA — public displays of affection — in the context of Christian camps or youth group meetings. Any rules that might exist are usually put in place with the intention of applying them to teens and twenty-somethings. Some churches have very strict standards on this, while in others, you’re probably wondering why this topic is even here today. Hand holding is a mark of commitment. If people want to know if it is true that the divorced usher on the east aisle is seeing the alto in the choir, walking in arm and arm should clear up that mystery in a hurry. In the context of gay relationships, in addition to being a gesture of affection, hand holding is really making the statement, ‘Yes, we are gay;’ and so doing this in church is a bold declaration of that situation. But today I’m not looking at PDAs as physical signs of relational status updates nor am I as concerned with the puppy love in the youth group. I’m talking about couples who have been married for some time and have nothing they’re trying to broadcast by being affectionate. A few years ago I attended three different church services on a single Sunday. I am always aware of men who put their arms around their wives during the service — and sometimes it’s the other way around — and there are times I do this myself. Whether the church in question has pews or chairs, I like to stretch out anyway, so whether there is an empty seat or it’s my wife sitting next to me, I am likely to do this, though I probably have my arm around her less than half the duration of the sermon. On the other hand — pun intended — there are the couples who sit really close and the hug lasts the duration of the sermon. (Except in summer in one church I visit which has no air conditioning.) I always see this as a church service = movie date type of posture. I would hope that in worship we see ourselves as standing before God individually even though as we sing we are worshiping corporately. The worship time is our personal response to God, and not something I can do with my spouse. (A possible exception might be if the worship leader invites everyone to join hands and sing a classic like “We are One in the Spirit,” or “Father Make Us One.”) I would also like to believe that in an ideal world, during the sermon we are busy taking notes, or looking up passages in our Bibles or Bible apps, even when the words are on the screen. I also believe that during the actual time of the service, our “arm around” is broadcasting more than we realize. It says to everyone that we are happy and committed. (Oh, if only they could see the chaos just ten minutes before we left home!) So in that sense, we are modeling what we consider to be the normal husband/wife relationship. We’re saying that the church family is a place where we are free to express that. It might be the only time we’ve had all week to just sit together. It does equate to something we might do at a concert, play or movie. In that sense, we are saying that we are observers; that we are the audience; when the worship environment should be one where we are participants. So while I realize the intentions and motivation in the first case may be pure enough, and while I hate to be The Grinch that ruined the only moment of affection you and the significant other had all week; the second, third and fourth points seem to suggest a more conservative approach. I’m not saying you won’t catch me next Sunday with my arm around my wife, but it’s good to occasionally stop and think our actions through. Any stories to tell on this subject? Another lifetime ago, I worked extensively with both live auditorium sound and mixing in a recording studio or television studio environment. I wrote articles to try to make that world a better place, and there’s one — this one — that I always wanted to repeat here but couldn’t find the original copy. Today that changes. These aren’t written for the sound tech guy who is employed full time in a megachurch and oversees dozens of volunteers. Rather, this is for the guy in the small to medium church who does this on weekends and has to endure the “neck crane” stares of parishioners when something goes wrong. Mistake #1: Failing to set the monitor level first. If the platform or stage monitors are working at all, they can be heard from the console with the main speakers turned off. While musicians and speakers will ask for these be more finely adjusted, they can be set to a respectable level and the entire system tested through the monitors before the main speakers are brought into play. A two-person team is a better minimum crew, but you can get more done from the back than you realize. Mistake #2: Failing to use ‘middle balance’ on equipment. Microphone and media inputs need to be calibrated with the main output level so that equipment is operating best in the middle of the range available. Levels for multiple singers should be “matched” through proper attenuation even before the monitors and main speakers are turned on. If the whole system is running too hot, levels may appear to be low. Sometimes it’s necessary to go beyond the sound board and reconsider the main amplifiers levels, which are often at the level when the system was installed. If the system is too cool, individual channels have to be turned up higher. Professional operators like to keep things around “7” (not “5”) for better fade-ins and fade-outs. This was often heard back in the days soloists would sing with soundtracks. The song would have a wonderful, professionally-produced sustained chord at the end, and the soloist would replace her microphone on the stand and the pastor would get up, and the sound person, in a total panic, would just cut the track. Not even a fade. Of course sometimes, you’d get the opposite, the person whose turn was next would feel they couldn’t move until the track played out and they’d stand there like a deer caught in the headlights. The point is that channel clipping still happens, especially with increased use of video clips. Anyone can turn up the volume. To do the job well, one has to listen to the tonal balance and set equalization positions on each individual channel. This is where a philosophy degree is helpful. For example, let’s say the soprano singer’s voice borders on shrill. Do you try to suppress that, or do you allow the tonal filters to let through what the music director must have liked when he auditioned her? You can’t just turn down her high end so she sounds like an alto. Some people were taught you don’t touch the EQ on the channels once the program begins. I disagree. Can’t hear the words? Try turning up the high end to enhance to consonants and make word-definition clearer. Use the mid-range to bring out the vowels. Turn up the bass to add richness and rhythm. Don’t make major changes in the middle of a song or sermon, but feel free to make small adjustments. Just make sure your speakers are handling this without distortion — especially with bass — and make sure fader levels are brought down when tonal filters are opened up. Also, have the overall EQ of the room checked every 3-4 months using whichever method you prefer, a white noise generator or a spectrum analyzer. Mistake #6: Not explaining equipment to users. Even a well-seasoned audio guy needs to be told as if he’s never seen the equipment before. When it comes to platform participants, this doubly applies. It’s also good to go over basic care of the board and microphones, and reminding soloists not to point mics toward monitors, cup hands over mics, and not leaving mics on the floor. Do your mics have switches? Make sure they remember this. Does the pastor need to switch on his cordless mic? This often saves batteries, but so many times speakers are intent about their sermon content and forget this important step. Mistake #7: Playing the wrong media. Anything that needs to be inserted into a machine during the course of the program needs to be well labelled. Back in the day, tape machines had a zero-reset that could be used to cue things to the start point and avoid “dead air.” Digital media solves many of these problems, but introduces new ones. If the video isn’t going to be used until 24:00 into the service, the machine may shut down after 20:00. Furthermore, some media requires greatly different EQ-ing and balancing than other line inputs. The more video you have, unless you have a discrete channel and playback source for each, many things can mess up. I would argue you can’t do video clips in the modern church without an audio production assistant. Mistake #8: Not balancing between singers and accompaniment. We’re in the communication business. People need to hear what is being said, both through spoken word and through music. So you need to decide: Is the singer too quiet or is the band too loud? This is complicated often by the age and musical taste of the person doing the mix. Different generations have different ideas about what sounds right. Also, the modern church will often post the words on the screen, even for a solo. That doesn’t preclude getting the mix right. Mistake #9: Failing to bring out the melody. This combines with the mistake above especially if there is more than one singer. The melody (the tune if you prefer) must dominate over the harmony. In a higher class of music, sometimes the melody is passed from the soprano to the the tenor. You may need more detailed cue sheets for this type of song. Or better yet, have a musician sitting next to you at the console providing visual cues. Or best, attend a rehearsal. Mistake #10: Not paying attention. Details, details, details! (Some would say, Coffee, coffee, coffee!) You need to be on top of your game making sure channels are opened at the right time (and also closed when they’re not needed) and to do this you need be eying the platform like a hawk. If there’s a cue you need to see and you can’t because of lighting or distance, I wouldn’t eliminate having a pair of binoculars at the console. Concern #1: Keep sound consistent from week to week. The only way to ensure this is with a decibel meter. Decide what your peak levels are going to be for music — you also don’t want it really quiet one week either — as well as the sermon. With sermons, there is a level at which the preacher is shouting and people don’t absorb what’s being said. Equally problematic however, is when the audience is straining to get the words because the level is too low. Don’t forget item #5 above as well with speakers. The high end (treble) will bring out the consonants and make the words clearer. Concern #2: Don’t violate copyrights. Increasingly, the many pieces of your tech puzzle can interact with each other. The cardinal rule that applies here is: Everything you can control you must control. Remember, the original document was written nearly 25 years ago. I’d love to hear from those of you who do this either as a volunteer in your church or professionally. I’m later posting today, and I’m writing this knowing that this will largely go unread in North America, as everyone is preoccupied with a major sporting event, the one Internet Monk referred to yesterday as the Superb Owl, because there is an obsession with not trespassing on the event’s trademarked name. At risk of offending a whole lot of people, I don’t think sports commentary has any place in the worship service. Ditto comments about the weather. From the call to worship to the benediction, the service should focus on God, Jesus, confession, forgiveness, the body of Christ, the resurrection and commissioning to leave and take the good news into the world. I don’t want to be a curmudgeon, and I’m all for seeker-friendly services (though seeker-targeted is another subject) but I just think we overindulge the sports enthusiasts and alienate those who came for the purpose of connecting with God and getting what they need for the 167 hours in the week to follow. To everything there is a season: A time for sports and a time for worship. But that worship hour is precious and let’s not squander a minute of it. …Okay, now go enjoy the game. Can You Be Spontaneous and Liturgical at the Same Time? Okay, let’s get the title question out of the way quickly: The answer is ‘no.’ To adopt a liturgical form is by definition to do away with spontaneity completely. Why pose the question? In many Evangelical environments, every word that is spoken is not written out ahead of time.2 This produces a tendency to “wing it.” On the other hand, those same Evangelicals often enter a liturgical environment and find it too sterile. Let’s face it, you can tell when someone who is reading something is just reading it. Cruising the interwebs, we found a piece by J.C. Holsinger at the Assemblies of God website. It’s too long to post in its entirety here but I hope some of you will click through. (Click the title below.) I like the way — from the perspective of his denomination — this article bridges the divide. …When the Assemblies of God was formed, the founders deliberately avoided using the words sacrament and liturgy. In fact, the founders carefully called the ceremonies of the church ordinances to avoid any sacramental connection. Hence rather than sacramentalism which the word liturgy historically brings with it, Pentecostals more accurately have ordinances and ceremonies. However, these ceremonies are important in educating and binding the generations of Christians together. Therefore, continuity and carefulness in performing these ceremonies should be practiced. I attended a wedding recently where the pastor opened the ceremony with a prayer: “As we hear these young people repeat their vows, may those of us who are married be reminded of the same vows we once took. Lord, help us to reaffirm our vows to You and to each other.” When he finished the prayer I almost shouted “Amen” because that is one of the most valuable purposes of ceremony–to educate and reaffirm important truths held in common, not just to provide a private or personal experience. Can such tendencies to personalize and individualize everything ultimately destroy the purposes and continuity of ceremonies in a society? Consider God’s command that Joshua require the leaders of the 12 Tribes to take a stone from the Jordan River to create a memorial. What if each of the 12 leaders or the 12 Tribes themselves had said, “We want to personalize our part of the ceremony.” Or, “I would rather bring a log,” or “I’ll pick up a pretty shell from the river that is special and meaningful to me.” Instead, they heightened the meaning with all the leaders repeating exactly the same ceremony. This made it possible for the next generation to ask, “What mean you by these stones?” and to be educated about God and their responsibilities to His purposes. For example, if a respected Christian couple brings their child for dedication and the minister says, “I know you are good Christians, so I am not going to ask you whether you will bring up your child in church,” does that not destroy the opportunity for the Holy Spirit to prick the hearts of all parents present as to whether they are carrying out their vows? Do we as church leaders affirm the importance of godly homes if at a Pentecostal church wedding the bridesmaids and bride come down the aisle more appropriately dressed for a nightclub than a church? Or music is sung at a Pentecostal church wedding that has sexual overtones more in keeping with a cabaret? Also interesting was information about an academic book releasing in 2017 by Mark Cartledge and A. J. Swoboda, Scripting Pentecost. You can read about that at this link. Your comments are welcome. We’ll return to this topic soon! 1 There are always exceptions to everything and one is a book that is a favorite among Pentecostals and Charismatics, Prayers that Avail Much which uses what would be termed Spirit-filled language, but consists entirely of pre-formatted prayers which can be used in a variety of life situations. 2 For a look at a brief period where something resembling liturgy overlapped Evangelical history, check out the Responsive Readings section of old hymnbooks. 3 For one approach to creating liturgy in a more current culture, check out my brief 2011 review of Common Prayer: Liturgy for Ordinary Radicals by Shane Claiborne et al. So about three years ago, I was speaking with a couple who operate their own automotive repair business. They were telling me how their primary purpose in attending church is to worship God, but people like to use Sunday morning to discuss car problems or even book an appointment to get some work done. That doesn’t happen so much. Maybe more in the U.S. than in my home country of Canada. But not a whole lot. But what really got to me about this couple’s story is that people were requesting consultation and wanting to book appointments during the offering (okay it’s like the seventh inning stretch in baseball at some churches), during worship choruses (well, in some places it is more like a rock concert than a worship opportunity) and even during a prayer (ouch!). Remember, they weren’t standing in the aisle passing out business cards, people were coming to them. Now, I love that worship services in western Europe and North America are slightly more casual. That necktie was choking me all those years and those shoes just plain hurt. But have we gotten too casual? Is a whole generation of church-goers emerging that has no sense of propriety; no sense of what it is supposed to mean to come into the presence of a holy God? Yes, now it is my turn. We can debate whether it is a matter of “custom” or a matter of scripture; I affirm the later. For 1900 years, the matter was clear: Women are to be veiled in church, men must not cover their heads. This is based on 1Co 11:2-16 and was understood this way – as I said – UNANIMOUSLY in ALL churches of Christ for two millennium! Now, in the WEST women took off the veil and became pastors – which is a severe discontinuation of Apostolic practice UNIQUE to the Western churches, esp. Protestants. And it is in THIS setting, that men became increasingly indifferent as well and started wearing their baseball hats to church a only couple of years ago. Also: Shorts are worn to church, and shirts are no longer tucked in – the body language became totally disconnected from the spiritual language we utter with our lips. Watch out: That’s contemporary Gnosticism! Where are these brave leaders who address misbehavior like this and put an end to it? Now, you might just dismiss this a comment from an ultra-conservative reader, but I don’t. Not completely. That sentence, “…the body language became totally disconnected from the spiritual language we utter with our lips;” is the part that haunts me. Typically, I find that people in blue collar jobs tend to dress up for church, while people in white collar jobs tend to dress down; at the same time as everybody tends to be very casual in their approach to weekend worship. Even the concept of weekend worship is a compromise which allows those who choose to have their entire Sunday free to play golf, picnic, visit family or head to the beach. …In the meantime, I feel for this couple who owns the auto shop. When this happens to me, I feign memory loss and tell them, “I can’t remember business stuff that happens on Sunday morning, but if you write it on a piece of paper, I’ll put it in my shirt pocket and deal with it on Monday.” And I actually do try to hold back some stuff to the next day. Furthermore, my job could justify getting them the answers they want because I could argue it’s kingdom business. The auto repair couple are trying to live their lives by a higher standard and are no doubt unimpressed by those who choose to violate their time of worship. If you were they, how would you respond to a mid-service request for brakes, steering or transmission advice or a service appointment? Should Couples Hold Hands in Church? Different denominations have different ideas as to the appropriateness of what is sometimes called PDA — public displays of affection — in the context of Christian camps or youth group meetings. Any rules that might exist are usually put in place with the intention of applying them to teens and twenty-somethings. Some churches have very strict standards on this, while in others, you’re probably wondering why this topic is here today. But today I’m not looking at PDAs as physical status updates nor am I as concerned with the puppy love in the youth group. I’m talking about couples who have been married for some time and have nothing they’re trying to broadcast by being affectionate. Yesterday I attended three different church services. I am always aware of men who put their arms around their wives during the service — and sometimes it’s the other way around — and there are times I do this myself. Whether the church in question has pews or chairs, I like to stretch out anyway, so whether there is an empty seat or it’s my wife sitting next to me, I am likely to do this, though I probably have my arm around her less than half the duration of the sermon. On the other hand — pun intended — there are the couples who sit really close and the hug lasts the duration of the sermon. (Except in summer in one church I visit which has no air conditioning.) I always see this as a church service = movie date type of posture. I would hope that in worship we see ourselves as standing before God individually even though as we sing we are worshiping corporately. The worship time is our personal response to God, and not something I can do with my spouse. (A possible exception might be if the worship leader invites everyone to join hands and sing a classic like “We are One in the Spirit,” or “Father Make Us One.”) I would also like to believe that in an ideal world, during the sermon we are busy taking notes, or looking up passages in our Bibles, even when the words are on the screen. At your church are the kids off in another part of the building throughout the service, or are they dismissed to the basement part way through? Perhaps another world is possible. The YouTube channel that I oversee is named after our retail covering, Searchlight Books, but consists almost entirely of classic Christian music songs that you can’t buy at Searchlight or anywhere else. More recently however, we’ve been including some sermon excerpts and this weekend we posted an eleven-minute segment from the Phil Vischer podcast where Wheaton College Associate Professor of Christian Formation Scottie May spoke about visiting inter-generational churches during her sabbatical. The full podcast runs about 45 minutes, and I knew no matter much I mentioned enjoying these each week, the click-through ratio would be fairly low, so we created this highlight. This is a must listen-to segment for anyone who cares about church and especially for people in children’s ministry or youth ministry. This is an audio-only clip with no moving images, so even if you are not on a high-speed connection and don’t normally click on video links, you should be find with this one. So earlier this week I was speaking with a couple who operate their own automotive repair business. They were telling me how their primary purpose in attending church is to worship God, but people like to use Sunday morning to discuss car problems or even book an appointment to get some work done. Now, you might just dismiss this a comment from an ultra-conservative reader, but I don’t. Not completely. That sentence, “…the body language became totally disconnect from the spiritual language we utter with our lips;” is the part that haunts me. There’s a trend emerging, but where is that trend taking us? Some say to just relax because in a few years, the men at the bank and the real estate office will be back to suits and ties. (In our town presently, the only person who wears a suit is the funeral director.) But is a whole generation that’s known nothing but casual Sunday likely to go formal? …In the meantime, I feel for this couple who owns the auto shop. They are trying to live their lives by a higher standard and are no doubt unimpressed by those who choose to violate their time of worship. If you were they, how would you respond to a mid-service request for auto service? The Church is Changing, But is it Changing Fast Enough? The Republican Party needs to realize that the country is changing faster than they are. — these superficial changes either belie attitude adjustments which never happen or are simply too superficial, not drilling down to the bedrock of the decision-making process which guides objectives and intentions. In other words; “Yes, we’ll add drums and electric and electric guitars as long as understand that we’re just doing this to reach out to the community, and not because it’s our first choice. And we’re leaving in Amazing Grace and Blessed Assurance.” Which is to say that we don’t really embrace change, it is simply something that has been thrust upon us. At a certain level, that’s okay. Reaching the community is a valid goal. But the world at large does embrace change; you could say the broader culture thrives on change. So we change, and the pace of change is increasingly accelerating, but meanwhile the pace of change in the wider marketplace is accelerating faster. All of which leaves us with churches with ‘relevant’ preaching that is becoming irrelevant and contemporary music in a world where ‘contemporary’ is somewhat of an adjective fossil. Or worse, we go casual and informal only to discover that the next generation actually craves liturgy or even pageantry. Or we go with slick multimedia not realizing the cry of peoples’ hearts is for interactive communication. Or we add some rap to the opening song in a city where the top radio station plays country. Or we address employment needs in a place where the greatest issue is depression and mental health. Or we build gigantic mega-churches which mitigate against the authentic community life some are seeking. Like the Republican Party, we’re left with a system that simply hasn’t responded to a changing world, because we’ve become so expert and so efficient at being the church to speak to the culture as it existed in 1995. Make more changes? I can hear the groaning at that thought, but as changes come faster and faster to every facet of life, we need to rewrite the playbook and the rulebook continually. Now excuse me while I nail this to a door somewhere.